Some children learn to read easily without much help. They practically teach themselves, sounding out words with little difficulty. Others don't. I have concluded that my son falls into the latter category. Every evening I listen to my son slowly and painfully read an early reading book. He carefully decodes a word and then has to decode the same word again when it appears in the next sentence. He pays no attention to punctuation. He stops often to look at the pictures...usually mid-sentence. I doubt he understands much of what he reads. I find it quite frustrating but I try my best to say nothing. This, after all, is very typical behaviour of a beginning reader. In fact, my son is doing amazingly well. An experienced reader recognises a word by sight, having seen it hundreds of times. They can even recognise the word if it is upside down, the letters are jumbled up or only some or part of the letters are showing. A beginning reader, however, has not seen many of the words they are trying to read very often, and so must decode a word in order to read it. This involves breaking the word down into units (or phonemes), remembering the sound for each of these units, blending these sounds together and then searching their memory for a real word that matches the blended sounds. No wonder a beginning reader finds it hard to also read with expression or fully comprehend what they are reading when they are busy doing all of that! However, with lots and lots of reading practice, your child will eventually learn to recognise words by sight. Indeed, it seems that the act of decoding a word in the early reading stage actually helps add it to your child's memory bank of sight words more quickly. Once your child can recognise words by sight they no longer have to sound out every word and can start to pay more attention to the meaning of what they are reading. They will take note of punctuation marks and increase the pace of their reading and so gradually their reading fluency with improve. So what can we do to help our children through this somewhat frustrating period of early reading, so that they can become fluent readers as quickly as possible? One of the most important things you can do to support your beginner reader is to choose appropriate books to help them practice their early reading skills. Choose books that are not too hard for your child. Making your child battle their way through difficult books is a sure way of putting them off reading. You want your child to start seeing themselves as a reader, and the best way to do that is to give them lots of successful reading experiences. If your child struggles for a long time with more than one in ten words choose an easier book, or be prepared to provide help with, or tell them, the more difficult words. 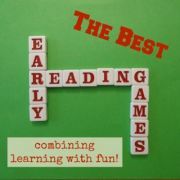 There are two types of early reading books you can choose for your child. Easy reader phonics books help your child to practice specific phonics rules by containing words which can be sounded out using these rules. If your child comes across a word they do not know they can decode it by breaking it down into phonemes and blending the sounds of each phoneme together. Authentic text beginner reader books contain short sentences written in simple language with some repeated phrases but are not written in order to practice specific phonics rules. Your child uses the pictures to help guess difficult words and through repeated reading starts to recognise words by sight. Both types of early reading books have their advantages and disadvantages so the best advice is to encourage your child to read both types of books. This way they will practice their phonics skills while also building up a repertoire of sight words and learning to use picture clues to help focus on getting meaning from what they are reading. Also try to expose your child to both fiction and non-fiction books. If you find it difficult to get your child interested in reading, you may find that a non-fiction book matching their current interests helps. Give your child time to read and be patient with them when they make mistakes. Learning to read is hard and the last thing you want to do is show your child any frustration you may be feeling at their slow pace or frequent errors. Try spending 20 minutes a day listening to them reading. 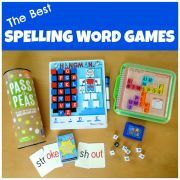 You could also try playing some of these reading games which help to practice skills such as sight-word recognition and phonics and also introduce new vocabulary. I have found that it helps to let my son hold the book so that he turns the pages at his own pace, rather than mine (which would undoubtedly be too fast). Finger-pointing can lead to exaggerated pauses between words so if you find this is the case with your child's early reading, encourage them to point only when they come to a tricky part. Help your child see themselves as a reader by providing plenty of praise and encouragement. Encourage your child to read the same books many times. 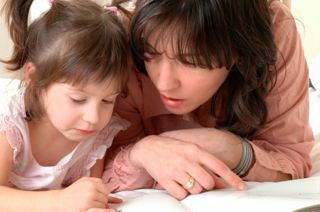 Reading the same words again and again helps your child to start to recognise those words by sight. 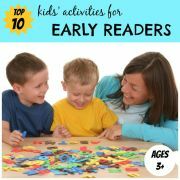 They will decode less, make less mistakes and start to read at a faster pace, which all leads to more fluent reading. …makes a mistake. It can be all too easy just to point out the mistakes, but this won't do much for your child's self-confidence. Try to correct your child as little as possible. Give them time to hear their mistake. Often they will notice something is wrong and go back and correct it on their own. If it is just a small mistake which doesn't affect the meaning of the text, let it go. If your child doesn't notice the error, ask them if what they just read made sense. Repeat back to them what they said, if necessary. Give them time to correct the mistake themselves. You can also try just pointing at the mistake instead of saying anything. ...struggles with a word. First keep quiet and give your child time to figure out the word. If they need help, ask them what the first letter is and encourage them to sound it and the subsequent letters out. If they are getting a particular letter wrong, just point to this letter silently. If there is a letter combination which is causing the problem (eg 'igh' in 'night') isolate those letters with your fingers and ask your child what sound those letters make. Then ask them to try sounding out the word again. To read longer, tricky words try breaking the word up into chunks for your child and ask them if they recognise any of the chunks. Feel free to tell your child a difficult word sometimes, for the sake of keeping the story going and easing any mounting frustration in your child during this early reading stage. ...is reading without expression. There are various things you can try to encourage your child to read with more expression. Ask your child to look at you and repeat a sentence as if they are talking to you. Or try reading the sentence back to your child with plenty of expression and ask them to copy you. Talk to your child about punctuation marks and show them how your voice changes at the end of a sentence, or at a comma, question mark or exclamation mark. Talk about who is saying what when you see quotation marks. Ask questions about what your child has just read to ensure they really understand the meaning of it, and then ask them to read the sentence again and try and get all of that meaning into what they are saying. Don't forget to compliment your child when they do read with expression and follow punctuation marks. My son loves it when we take turns reading aloud. I read a few lines and then he reads the next few lines. Some books are designed to be read like this, with the parent often having more difficult words to read. But you can do this with any early reading book. By sharing the reading, the flow of the story will improve, making it easier for your child to understand what they are reading. What is more, your child will be able to hear what fluent reading sounds like and so can then start to mimic it. If your child is struggling with a particular passage, read it aloud to them and then ask them to reread it to you. Try reading the passage at the same time as your child too. 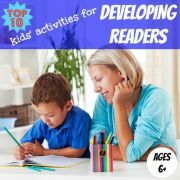 This will help your beginning reader to read at an appropriate pace and with expression. The purpose of reading is to construct meaning from the words on the page. There is no point in being able to read if your child does not understand what they are reading. At this stage of early reading, much of your child's energy will be focused on working out what the words say. However, you can still spend some time helping them to understand what they are reading by asking them questions about what they have just read or what they think might happen next. As well as asking questions, you can use a range of other reading strategies such as making connections, visualising, inferring and summarising, to help deepen your child's understanding of what they are reading. Do be careful, however, not to interrupt the flow of the reading too much. This can end up being frustrating for your child. 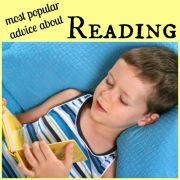 With all this focus on listening to your child reading to you, don't forget to also keep reading aloud to your child. This is still a great way for your child to learn new vocabulary. Vocabulary plays an important role in learning to read since children use words which they have heard to make sense of the words they see in print. By reading aloud to your child you are also modelling what fluent reading sounds like which, as mentioned above, is important for a beginner reader. At this early reading stage, you are able to read aloud to your child more interesting stories than they can read themselves. This can help to nurture their love of reading which may otherwise dwindle at this frustrating time. Finally, if you read aloud a variety of books including non-fiction books, you are helping to build your child's background knowledge which will also help them to make sense of what they read independently. 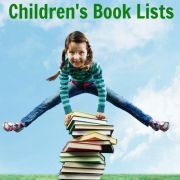 Check out these ideas for picture books for older readers, many of which are favorites of my son.